I am of medium build and medium height. Until my early 20’s, I was healthy and slim…average. Unfortunately, that description changed after I graduated college. A full-time job sitting behind a desk all day and fast food lunches while always on the go where ultimately what did me in. One day while sitting along a triathlon route, some folks caught my eye. People who were overweight, but still doing it…and doing it well. Swimming, running, biking. They were champions in my eyes, more motivation to me than I can put into words.They were champions in my eyes, more motivation to me than I can put into words.It was like someone flipped a switch in my brain. “Why can’t I do that?” The very next day I took up running. The first event I signed up and trained for was a half marathon. I could see the looks. The head to toe glances I’d get. I could see others looking at the shape of my body while listening to me tell them my goal. I could see the doubt in their eyes. I completed that goal, and many more, all because of those inspirational people on the triathlon route showing me I could. Unfortunately, because running is a sport, injury is always a possibility. After running hundreds and hundreds of miles, and filling my closet with 5K, 10K, and half marathon tshirts, I ended up with a stress fracture in my knee. Crutches were awarded instead of a finisher’s medal. In lieu of celebration and a sense of accomplishment, I ended up with weight gain and depression. I was right back to where I was before I started running. Actually, I was worse. I’d read about yoga helping sports recovery, so I signed up for a class. If I hadn’t been so desperate to find something to help me get back to running, I never would have given it a try. There was no way my bigger body was going to do some of the poses I had seen in magazines! At first, I mostly looked for the physical improvements. (Better forward folds, more open hips and hamstrings – the things that would help my running.) The OTHER benefits were what really impressed me and got me hooked. It provided self-confidence, improved self-image, stress relief, clearer skin (I kid you not!!) and it was something that anyone could do. Size, shape and age weren’t factors at all. To my astonishment, the weight I’d gained after my injury didn’t keep me from developing a strong yoga practice. A few years later, I enrolled in yoga instructor training. During our teacher training, we were asked who we wanted to teach…. Our ultimate “target audience.” I’m drawn to those who are just starting out, those who are nervous, hesitant, curious, or embarrassed. Those who want to try yoga but, for some reason, think they can’t or shouldn’t. I knew deep down inside I wasn’t the only person with questions and doubts about yoga. I knew there were other people like me, who would benefit from it on so many levels. We’re all individuals….separate, unique people. We don’t all look the same. We all have our own story. Going to yoga isn’t like going to an amusement park, where there’s a sign at the front of the line saying “you must be this tall to ride this ride.” It’s not that black and white. I’ve had countless conversations with people who genuinely want to take a yoga class, but are afraid…. and just as many conversations with those who have tried, but never went back. They say they felt out of place and different from everyone else in the room because of the size of their bodies. Their stories broke my heart. I remember the looks I received when telling people about my running goals. And I am still greatly aware of the looks I get when I tell someone I teach yoga.I remember the looks I received when telling people about my running goals. And I am still greatly aware of the looks I get when I tell someone I teach yoga. From these conversations came the motivation for me to obtain an additional “Curvy Yoga” certification. When it was complete, I began XL Yoga (XLY). My goal is to help make yoga an option for those who never thought it possible, and to provide a space where students feel comfortable practicing yoga using modifications, props, and intelligent choices based on their own bodies. Not everyone falls in love with yoga, but I want to create an environment where they feel comfortable giving it a try. Short, tall, young, old, big, or small…..we all have our limitations. There are things one person can do like a rock star, but another may never be able to do. We’re all essentially the same. Muscles stretch and provide strength, tendons and ligaments hold us together. But we also all have hurdles and obstacles to work around. Extra flesh might get in the way during forward folds…but there are ways to adjust. If you can’t support all of your weight on your wrists…..then don’t do it. Need to take a break during class, take one. It’s your body, it’s your time, it’s your yoga practice. To those with rounder bodies who think they aren’t right for yoga, I encourage you to give it a try. The question isn’t whether you’re right for yoga, it’s whether yoga is right for YOU. And only YOU can make that call. Forget about the size of your body, and take a look at the size of your heart and your soul. Those are the sizes that matter most. Jen Weaver is a graduate of the Sound Method Yoga teacher training and is the only Certified “Curvy Friendly” instructor in the region. 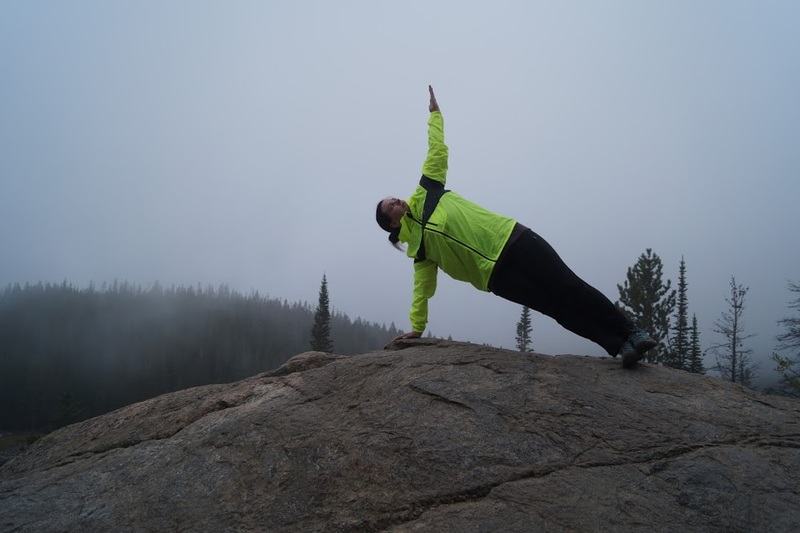 Her interests are diverse and varied and include stuff like yoga, running, backpacking, kayaking and even curling! She teaches Beginner’s Flow at SMY on Wednesday evenings and Sunday mornings. She is also the instructor for Curvy Yoga at SMY. We offer Curvy Yoga Level II on Sundays at 11:45 am on our drop in schedule and Intro to Curvy Yoga as an 8 week session offered a few times a year. Learn More here.